Belgium survived the Japan scare in the last 16 round to set up a mouth-watering quarter-final tie with the five-time champions Brazil on Friday evening at Kazan’ Arena. We are thus in for a thrilling evening of football in what has prospects to be the best outing of the tournament with two star-studded squads set to cross each other’s paths at the biggest stage. The stage is set for the clash of the titans in what could be the most exciting contest of the tournament on Friday evening in Kazan. Brazil conceded just one goal so far and only three in last 15 games in all competitions. Belgium edged past Japan thanks to a last-gasp winner from substitute Chadli to complete a stunning comeback from being two goals down. Selecao notched a comfortable 2-0 victory over Mexico on the same day. Belgium were on the verge of an abyss when Takashi Inui doubled Japanese lead early in the second half. The Red Devils looked powerless and destined to ruin a huge opportunity for their golden generation of footballers, led by the Premier League stars, to lead them all the way. The comeback looked to be a mission impossible when Chelsea’s Eden Hazard only hit the woodwork at the hour-mark, but that was just about the time when the head coach Roberto Martinez made a crucial move. The Spanish manager felt he should shift to set pieces as he introduced Marouane Fellaini and Nacer Chadli on the pitch. The response was instant as Jan Vertonghen’s looping header pulled one back for the Red Devils even though we have to mention Eiji Kawashima had to do better to deny the 20-yard header there. The second came from the man who has just signed the new Manchester United contract as Fellaini’s header landed behind Kawashima’s back after Hazard’s cross. Belgium shifted the momentum their way after clawing their way back into the contest as they produced a textbook example of a break when the other substitute Nacer Chadli steered Meunier’s ball home for a magnificent comeback to send Belgium into their third consecutive quarter-final at a major tournament. Brazil had a less dramatic route to their seventh subsequent World Cup quarter-final as their stalwart Neymar inspired a 2-0 victory over Mexico. It was not entirely a one-way street for Selecao, but they seemed to have control over the course of 90 minutes preventing a serious threat from dangerous attacking line of Mexico’s on the occasion. Tite’s main concern ahead of the quarter-final will be Casemiro’s absence as Real Madrid’s midfielder is suspended after receiving his second yellow card of the tournament in a 2-0 win over Mexico. His Madrid teammate Marcelo skipped the clash with El Tri and his presence on the right-wing will be a game-time decision for Tite. Gabriel Jesus is yet to make an impact in the tournament and he could make way for Roberto Firmino on Friday. Douglas Costa is back in training after injury, but he is likely to settle for a place on the bench. Best actor of the tournament Neymar and Philippe Coutinho are one yellow card away from missing the next game if Brazil qualify for the semifinal. 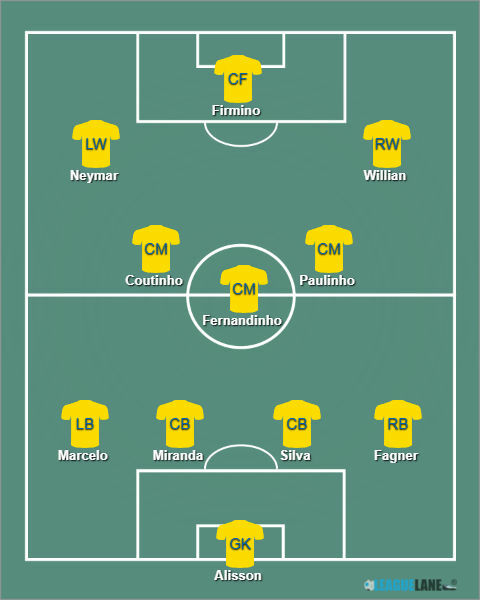 Alisson – Fagner, Thiago Silva, Miranda, Marcelo – Paulinho, Fernandinho, Coutinho – Willian, Neymar, Firmino. Martinez brought back his strongest squad after resting most of stars in the final game of the group stage against England. 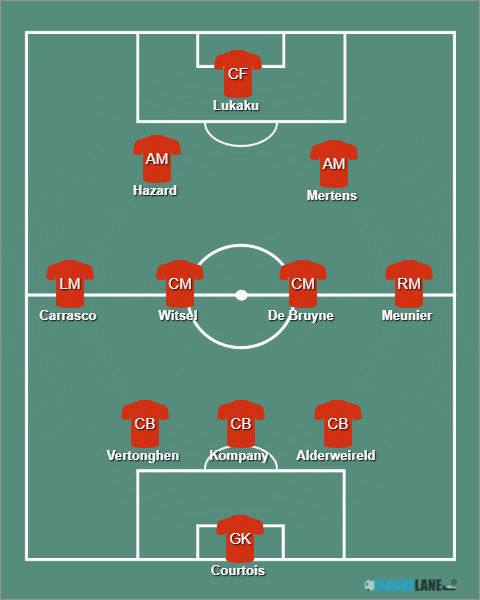 It will be interesting to see whether he will use the same 3-4-2-1 formation after the defensive line with Alderweireld, Kompany and particularly Vertonghen proved out to be quite vulnerable. Yannick Carrasco made no impact at all on the right flank, but we doubt either Thorgan Hazard or Adnan Januzaj would get the chance to start instead of him. 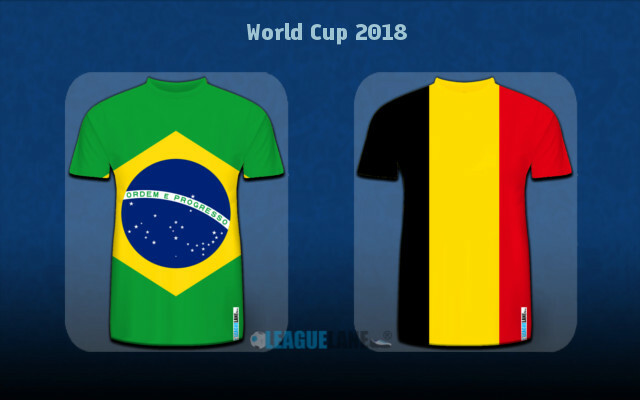 This will only be the second ever head to head encounter between Brazil and Belgium. Selecao won the lone previous tie which took place in the last 16 round of the 2002 World Cup in Korea/Japan. Rivaldo and Ronaldo broke the Belgian resistance with second-half goals en route to the title with the victory over Germany in the final later on. Even though Belgium have world-class stars in their ranks, we can hardly see them as a match to Brazil at this stage of the competition. The Red Devils were stopped in quarter-finals of both World Cup 2014 and EURO 2016 in spite of possessing pretty much the same squad. They are now up against five-time champions who are desperate to bring the trophy back to Brazil after suffering a disastrous semi-final defeat to Germany four years ago on the home soil. Selecao head into this undefeated in 15 games, a streak which saw them conceded just three goals in the process. It’s fair to say their defensive displays under Tite are more than impressive. However, Belgium do have a super strong firepower on display with the likes of Romelu Lukaku, Dries Mertens, Eden Hazard and Kevin de Bruyne as we just have to go for the 1.80 odds offered for goals at both ends here. Martinez’s defensive woes are huge as the team showed the lack of meticulousness at the back against Japan who could have scored more than two goals on breaks. We are rather sceptical about the chances of their three-man defense stopping cry-baby Neymar or Philippe Coutinho, Gabriel Jesus and Willian. Predicted Full-Time Result is a victory for Brazil in what could likely be a high-scoring thriller at Kazan’ Arena. The correct score prediction would be 3-1 Brazil at the sky-high 19.00 odds. Brazil to win @ 2.10.